The Tudor bar at The Old Bell Hotel is one of the most atmospheric bars and spaces in the building and arguably in Derby. Its iconic Tudor styling and grand open fire have made it stand out over the years and behind its panels and doors lies some deep history of Derby. 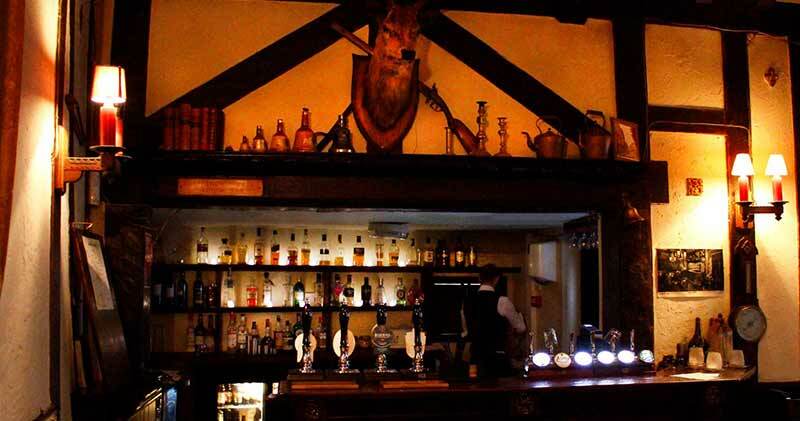 Despite its traditional style and Tudor look the bar itself dates back to the early 1900s. When The Old Bell Hotel was first built the space that was the Tudor bar was once a row of small cottages. These cosy buildings were often the homes of the staff at The Old Bell Hotel and their families. When the Tudor Bar was built its main use was as an exclusive men-only bar. Many of Derby’s high fliers were seen in the bar including judges, police officers and councillors. The bar had a reputation for being a smoked filled room where men would often gather to talk sport, politics and other issues. One group of men gathered in the bar were reported to be discussing whether someone sat in a jail cell should be hung or sent to prison. After finishing their drinks, they decided the man should hang. Today the Tudor bar is open to everyone, but you can still see signs from its past as a gentleman’s bar as it had only one toilet labelled for men (this is now a unisex toilet). During the Tudor Bar’s time as a men-only bar it was strictly off limits to women, however, there was one who was able to be in the bar and that was the head barmaid Alice. Alice was the head of the house in the Tudor bar for many years. The bar was ran like a tight ship under Alice’s reign and she was known for being strict and stern. Alice often gave some of the men a telling off for poor behaviour or disrespecting the bar. She earned the respect of the staff and patrons and she worked in the bar long after her retirement. You can still see Alice in the Tudor Bar today in the large painting of the bar that hangs on the wall. The Tudor Bar is filled with historical relics and throwbacks to the past. When looking at photos from its past you’ll be able to spot a few similarities, some we’ve replicated, and others are original. Some of the original features of the Tudor Bar include the grand fireplace which uses reclaimed materials that date back to when The Old Bell Hotel was first constructed. Other parts of the Tudor bar have been replaced or copied including the stags head and rifles that sit above the bar and the stained-glass windows that let colourful light flood the bar in the day. The Tudor Bar was the first part of The Old Bell Hotel to undergo extensive renovations. Over £55k was spent on the Tudor bar to get it to look almost exactly how is did in the nearly 1900s. When the building was taken over the bar had fallen into the cellars, the roof was patchy with rain pouring in and the Tudor-style panelling was in desperate need of repair. It was also discovered that a coffin lay underneath the bar (and remains there today). The team used some of the historic photos of the building to help restore it to its former glory and open it for everyone to enjoy. Today you can enjoy a range of beautiful gins, whiskies and real ale whilst immersing yourself in a rich piece of Derby’s history. The Tudor bar is open every Friday and Saturday from 12 until late.